The Reaction Attraction with an entertaining and spectacular chemistry demonstration by Anne-Francis Miller, Jack Selegue, and Erin Peters. Demonstrations of scientific glassblowing by Jeff Babbitt. A peek at the “Spirits Chemistry” course offered by Bert Lynn. A crime scene based on the “Forensic Science on Television” course taught by Mark Lovell. The Chemistry in Comics collection of Jack Selegue and Jim Holler. The Chemistry Alumni Board held its annual meeting, and an informal reception was held at the Helen King Alumni House. Recreational activities included a guided hike with chemistry faculty at Natural Bridge State Resort Park. Left: The Reaction Attraction offered entertaining chemistry demonstrations. 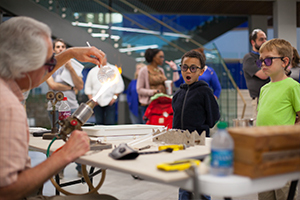 Center: Jeff Babbit demonstrates scientific glassblowing. 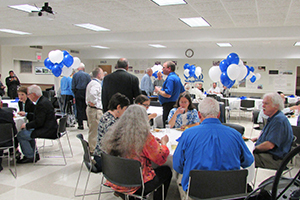 Right: Chemistry alumni enjoyed an informal reception at the Helen King Alumni House interacting wit Department of Chemistry faculty. 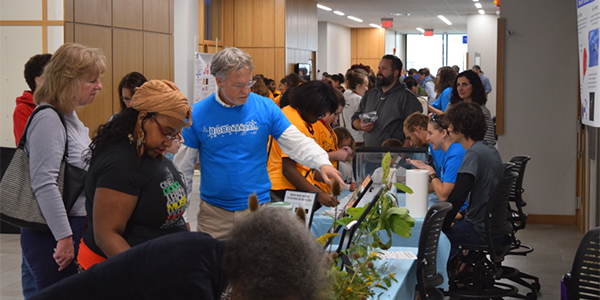 This fall, the department of biology hosted BioBonanza, a one-day open house festival that showcased interactive displays on research taking place in the department. More than 430 people attended and were able to interact with 22 hands-on displays, such as butterflies and other insects, crawfish, zebrafish, and native plants, and how human hearts work, to name a few. The BioBonanza, a one-day open house for the Department of Biology, drew more than 430 people. Among the researchers were graduate student Cole Malloy and his mentor, neurobiologist Robin Cooper. The pair is studying how the nervous system adapts to changes in the environment using fruit flies and crayfish. A PILLAR OF THE DEPARTMENT OF PHYSICS & ASTRONOMY, Professor Emeritus Keith MacAdam died on Nov. 6, 2016, at the age of 72 after a brief acute illness. In the four decades since MacAdam first arrived in Kentucky, he strengthened the program in countless ways through exemplary teaching, research, service, and philanthropy, and his impact will be felt for many generations. 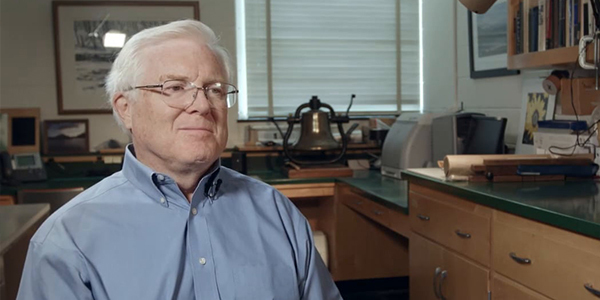 MacAdam came to UK as an assistant professor in 1977 and built a campus-based research program in experimental atomicmolecular- optical physics with students and post-docs, supported by the National Science Foundation and the Research Corporation. MacAdam’s research was widely recognized in the international physics community, focusing on crossed-beam collisions between charged particles and laser-excited atoms in highly excited “Rydberg” states. 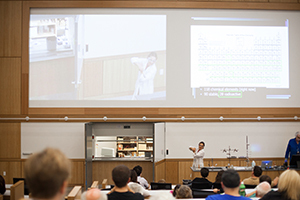 At UK, he taught students from first-year to graduate, and he introduced and taught for many years a popular non-majors’ physics course, “How Things Work.” He served as department chair in 1997–2001 and chaired the College Executive Committee in 2007–08, among many other committees. MacAdam also established a Graduate Excellence Scholarship in Physics. In 2014, MacAdam was inducted into the College of Arts & Sciences Hall of Fame.